I recently started taking high doses of vitamin C every day. And, I now consider Vitamin C to be one of the most important nutrients that can immediately improve your health and happiness. Vitamin C (ascorbic acid) is one of the most crucial antioxidants that your body needs in order to prevent scurvy, strengthen your immune health, and reduce oxidative stress. Research also shows that vitamin C plays an important role in fighting infections, treating cancer, synthesizing collagen, healing wounds, and improving cardiovascular health (1). But, did you know that taking vitamin C can also improve your mental state? For example – medical literature makes it clear that oxidative stress can trigger neuropsychological disorders (2). And, vitamin C is an antioxidant, which by definition means that vitamin C combats the damage caused by oxidative stress. This makes vitamin C especially useful to those who struggle with anxiety, depression, and mood imbalances. Vitamin C is ultimately one of the most well-rounded, powerhouse nutrients that you can use to boost your overall health and livelihood. When your body is stressed, sick, afraid, or toxic – your system starts to use a LOT more vitamin C than usual (3). For example, between all of the harmful ingredients found in food, environmental toxins (like heavy metals and plastics), and work-related stress that you probably encounter on a daily basis – your body is most likely being depleted of vitamin C at a fast rate. And surprisingly, human beings are one of the few mammals on this planet that do not produce vitamin C.
This means that most people need to take additional vitamin C beyond what’s normally absorbed from fruits and vegetables. I’m writing this article because of the noticeable mood lift and reduction in anxiety that I personally experienced after supplementing with high doses of vitamin C.
I may have been slightly deficient in vitamin C – and that definitely could have been the reason for my positive experience. Overall, it’s important to keep in mind that oxidative stress is considered to be the leading cause of depression and anxiety disorders (7). And, vitamin C is known as an antioxidant that fights the damage caused by oxidative stress. 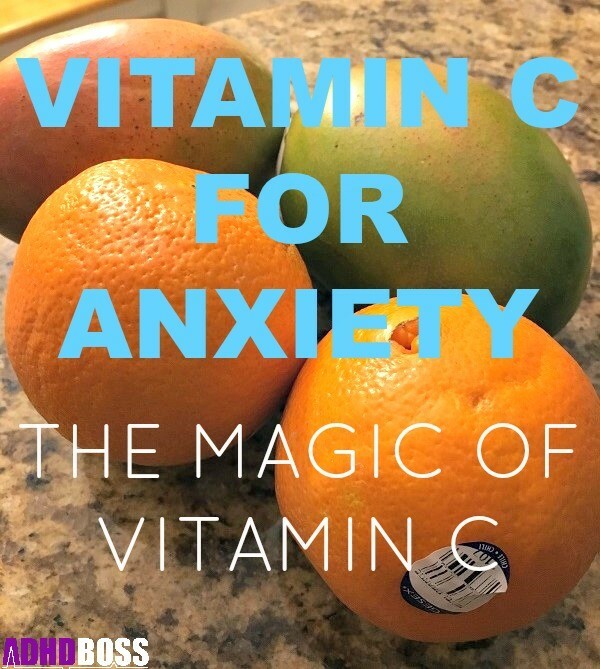 So, it should be clear that using vitamin C for anxiety is an extremely wise decision. I like using powdered supplements rather than capsules whenever possible. There’s definitely nothing wrong with using capsules. But, I sometimes get sick of swallowing pills. I’m sure that you feel the same way. 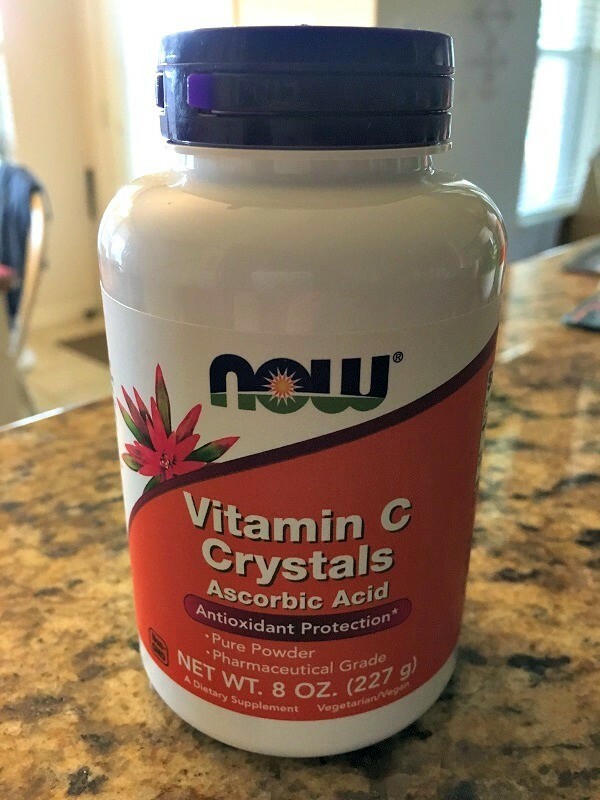 So, the Now Foods Vitamin C Crystals (Amazon) is ultimately one of the best vitamin C powders that I recommend using. It’s pharmaceutical grade, 100% pure ascorbic acid. Now Foods is also a reputable, affordable brand that I use for many of my supplements. I haven’t ever experienced any issues with their products. How much vitamin C powder should you take? One half teaspoon of Now Foods Vitamin C Crystals is equal to 2,250 milligrams of vitamin C.
So, I take one half teaspoon of this powder (2,250 milligrams of vitamin C) two or three times per day. 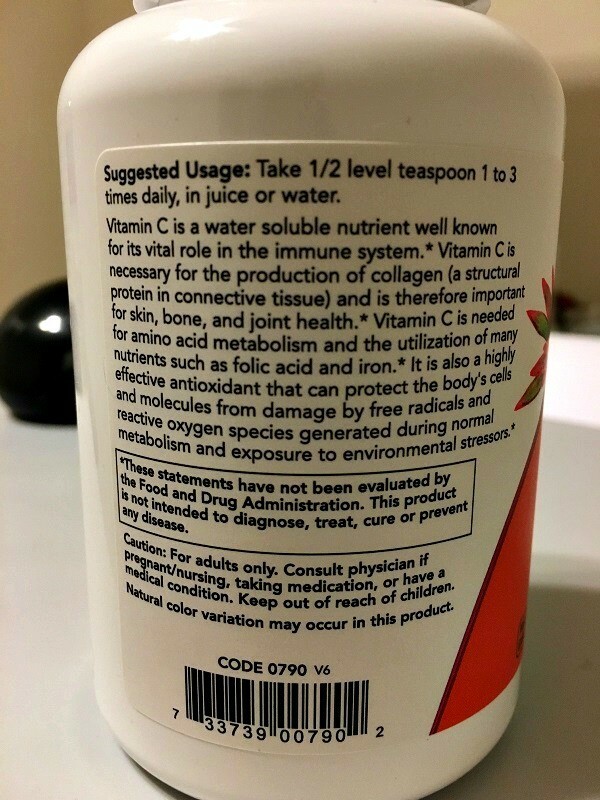 The dosing instructions are also clearly printed on the product label – if you ever need a reminder of how much vitamin C to take. Most people can comfortably take anywhere from 1,000 to 6,750 milligrams of vitamin C per day to strengthen their immune system, fight free radicals, combat sickness, and live a less stressful and anxious lifestyle. However, it’s also worth noting that the current recommended dietary allowance (RDA) of vitamin C is just 90 milligrams per day for adult men, and 75 milligrams per day for adult women. While there’s nothing wrong with taking just the bare minimum RDA of vitamin C (doing so will help you prevent scurvy) – taking high doses of vitamin C has been shown to improve physical, mental, and emotional functions in certain populations (especially those who are chronically sick). ADHD Boss is a website that generally focuses on helping people deal with moderate to severe health issues. This is why I recommend that most readers supplement with higher-than-average doses of vitamin C.
The medical literature has virtually ignored 75 years of physician reports and laboratory and clinical studies on successful high-dose vitamin C therapy. Effective doses are high doses, often 1,000 times more than the US Recommended Dietary Allowance (RDA) or Daily Reference Intake (DRI). It is a cornerstone of medical science that dose affects treatment outcome. This premise is accepted with pharmaceutical drug therapy, but not with vitamin therapy. Most unsuccessful vitamin C research has used inadequate, low doses. Low doses do not get clinical results. Investigators using vitamin C in high doses have consistently reported excellent results. High doses were advocated almost immediately after ascorbic acid was isolated by Albert Szent-Gyorgyi, M.D. (1893-1986). Notable early medical pioneers of high-dose vitamin C (ascorbate) therapy are Claus Washington Jungeblut, M.D. (1898-1976); William J. McCormick, M.D. (1880-1968); and Frederick R. Klenner, M.D. (1907-1984). More recently, important work has been published by Hugh D. Riordan, M.D. (1932-2005) and Robert F. Cathcart III, M.D. (1932-2007). Vitamin C is a water-soluble vitamin. Your body doesn’t store excess amounts of vitamin C.
This makes vitamin C an extremely safe antioxidant to use. You won’t overdose on vitamin C.
But of course, you should still talk to your doctor before using vitamin C, just to be safe. And please remember to divide your doses of vitamin C into small quantities. Taking too much vitamin C at once can lead to nausea, an upset stomach, or diarrhea. If you experience any of these symptoms, you should lower your dosage of vitamin C.
Like I said – I personally take 2,250 milligrams of vitamin C two or three times per day. This dosage works great for my system. But, you might need to adjust your doses accordingly. At the end of the day, you’ll simply need to experiment with using a little bit of vitamin C, listen to your body (and your doctor), and adjust your doses based on how you feel. Overall, when you’re dealing with high amounts of stress and anxiety – you need every little advantage that you can get in life. If you’re willing to give vitamin C a try – I think that you’ll be extremely happy with your results. Also…if you’ve used vitamin C to help with anxiety, depression, or just general health and well-being – then I want to hear about it. Can you please drop me a comment below, and explain if you’ve personally benefited from taking vitamin C? Your comment will help the ADHD Boss community tremendously. Thank you. I have Inattentive ADD with Anxiety and Depression and I have found high doses of vitamin C to be really helpful in lifting my mood and energizing me in both body and mind. Thank you for your kind comment Robin. That’s awesome to hear that vitamin C works so well for your mood and energy level. I’m the same exact way. Lately, I’ve been taking a relatively high 7,500mg of vitamin C powder every day (split into three separate doses), and I definitely feel a major boost. Have you had many people comment that high dose of vitamin C has helped their anxiety and depression? Thanks so much for your comment Kristin. I agree that taking vitamin C is an amazing mood booster. It’s really amazing how well it works. Hey John. I’m honestly not very familiar with Ester C. If it’s good quality vitamin C, then you’ll probably feel better after taking it. I wish you the best, but I obviously can’t make any guarantees. Yes, vitamin C has been shown to help with anxiety if you’re experiencing a lot of stress in your life. But, it’s best to consider a wider approach for dealing with anxiety. You also have to consider your diet, exercise, beliefs, etc. There’s a lot that goes into dealing with anxiety. Please follow up with a good naturopathic doctor who you trust for best results (or a conventional MD, if you choose to go that route). I suffer from mild depression and all throughout my adult life I have tried so many different supplements and herbs and Antidepresant with very little effect and yet few days ago I suddenly felt ( almost like a divine inspiration) that I should experiment with high doses of vitamin C And the positive effects on my mood and anxiety was almost instantaneous! I’m still perplex as to how I got the wisdom to take vitamin C in high doses to treat my depression! Maybe the angels do exist after all ?! Tiry, that’s so amazing to hear that high doses of vitamin C have improved your mood and anxiety. I’m very happy for you. Hello!!! You know I love your blog!!! So here’s the deal: I would love to take a high dose of vic C few times a day, but apparently vit c shouldnt be taken within the window of adderall/vyvanse. So I can only take it at night, maybe 2g max…Solutions? Ideas? Thanks!!!!! Hey Natalia. Hope you’re having fun! Vitamin C is actually really perfect to take whenever you feel a Vyvanse/adderall “crash” coming on. So you’re definitely right about taking vitamin C at night, once your meds are starting to wear off. 2 grams is perfect to start with. Hi there! I have SUFFERED with anxiety and OCD for years. It was ruining my relationships. I tried so hard to change who I was and how I reacted to things but nothing worked. I felt doomed. Until recently…I made a mid day snack of sliced bell peppers and within 30 mins, I felt my anxiety lift. It was like a miracle! I have since been researching Vit C and landed here. I will definitely be trying your suggestions and advising anyone with anxiety to try Vit C. I am amazed! Thank you for confirming that Vit C is amazing. Who knew? That’s so interesting to hear that sliced bell peppers lifted your anxiety. Yes, bell peppers have an extraordinary amount of vitamin C, so I can definitely understand how that helped you so much. You’re very welcome for the article. Please keep spreading the word about the powerful potential of vitamin C. Most people still underestimate just how important vitamin C truly is for the human body. How quickly has everyone seen a body in mood and relief from anxiety? I suffer from anxiety attacks to the point where I can’t even leave the house. It’s miserable. I take 1000mgs most days but maybe a major increase would help given that my anxiety depletes that? I do not want to take medicine because in the past it hasn’t helped and is horrible coming off of. I feel there are natural ways to get this under control. Thoughts? Hi Alex. Your anxiety attacks seem severe enough to where you might need the help of a professional. I honestly wish I could help you, but it sounds like you need to chat with someone who’s far more qualified than I am. Please don’t be afraid to talk to a therapist. Or, if you’re set on going the natural route, then you can always visit with a naturopathic doctor. A good naturopath will definitely be able to help you out. I wish you the best of luck. You have to face your fears /sensations that you experience and not run from them, eventually, you’ll be able to feel comfortable with the sensations instead of letting the fear take over your life. Also, take magnesium glycinate 1,000 MG -1,500 mg.. it will help calm your nervous system . I wish you relief. I have anxiety and I have experienced a lot of relief from what I mentioned. I just started taking the 1,000 MG of vitamin c (ester c). Hopefully it I can see even more better benefits. physical, mental and emotional balance to us all. I’m interested in your article. I recently started taking large doses of vitamin c as had recent stress and post menapausal. I felt an instant lift and did have a little nausea, so take smaller amounts in day. I had digestive upsets, and decided to take the Thornes buffered but c with magnesium and calcium to gentle on my stomach. Any thoughts as to this product? Thorne creates amazing products so it sounds like you’ll do very well with that Claudia. Glad to hear you’re enjoying the magical benefits of vitamin C. It works so well for me too. I agree with you on this. I am very sensitive with stress and i feel depressed often. Recently i started taking vitamin C, D and other supplements because i got really bad allery during summer time. Shortly after that, i broke up with my boyfriend. I was supposed to feel really bad but somehow i felt less stressful than i thought i should feel. Maybe just 7/10. Even myself feel it kinda weird. The only thing changed in my routine is that i have been taking vitamins recently and i did my research about the connection between vitamins and emotional health. And i found your article. Thank you for this. Hi Sandra. I can’t give medical advice, so you’ll have to ask your doctor about this one, since you’re dealing with depression/antidepressants. I wish you the very best of luck though! Wish I could help.